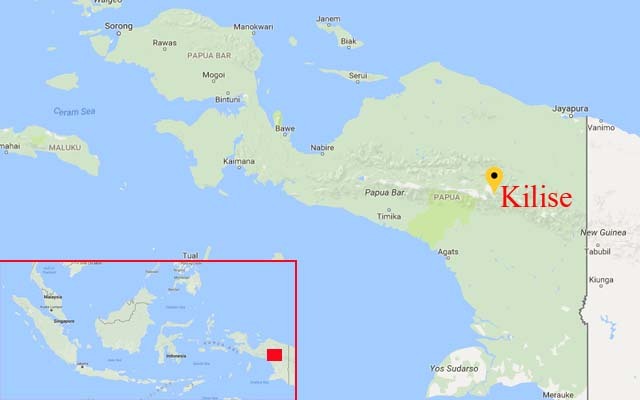 1 hour flight from Sentani Papua airport to landed at Wamena airport. During the flight, I was amazed at Papua's hilly, mountainous landscape of the Mamberamo river that splits the mountain. 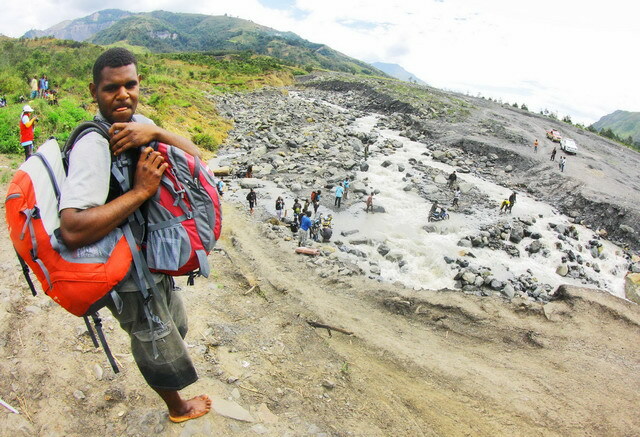 In the valley of Baliem-Wamena my journey began to see the inside of Papua. With our 4 wheel drive to Sogokmo. 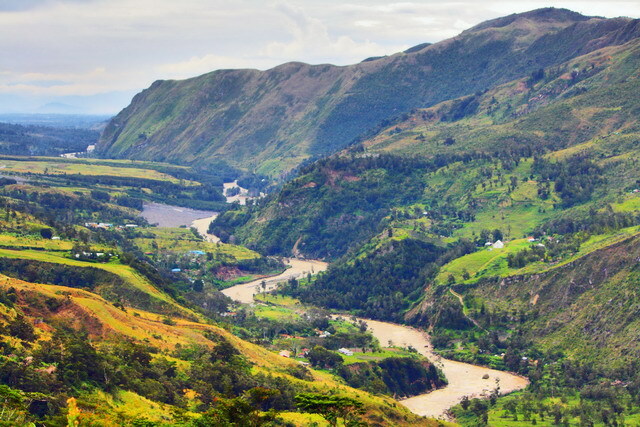 A district bordering the districts of Wamena and Yahokimo. The heavy Yetmi river stopped my footsteps. The river as a border of two districts seems very unfriendly with new comer like me. The stream of the rushing river and the temperature is very cold I must pass by crossing barefoot. 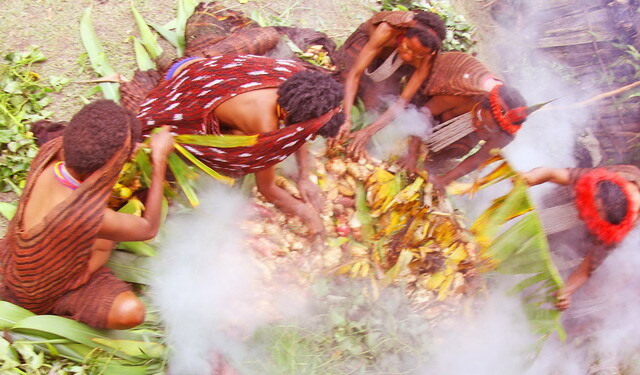 This is a welcome greeting in Papua. 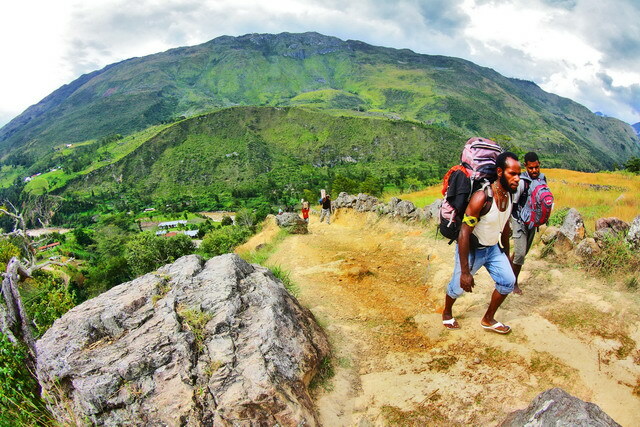 The journey continues with a walk of 8 Km to Kilise Village. The village of Kilise is one of the villages in Yahokimo region which is now a cultural destination. In this journey, I passed the small hamlets inhabited by several heads of the Family complete with honai and pilamo. 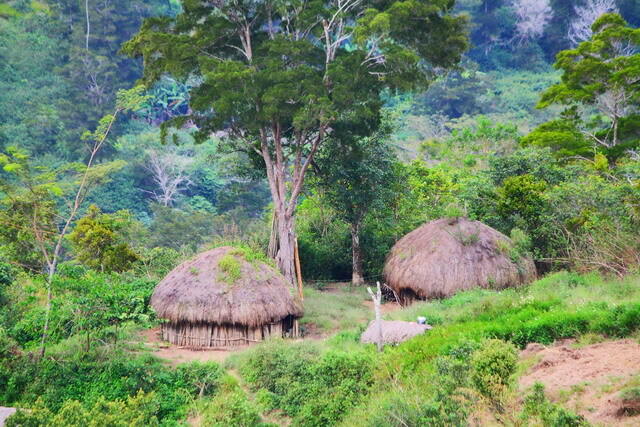 Pilomo or Honai is traditional houses from Papua-Wamena. Yetmi river at baliem Valley. 3 hours walk, finally arrived at Kilise. The little church building on the hill greeted me. The air is cold because it is located at an altitude of about 2.210 m asl. The fog came and went because the wind was blowing so fast. Residents here say this area is the door of the wind. Areas with deep valley-shaped contours and a deep ravine become the path of the wind to move. One of the interests of this trip was when I watched from near the red fruit/buah merah figure. During this time, I see red fruit only from mass media, television or newspapers. In Kilise I see growing in some places especially those close to the water flow. Red fruit appears to flourish with dense leaves and ripe fruit. Red fruit or buah merah the unique fruit from Baliem valley. 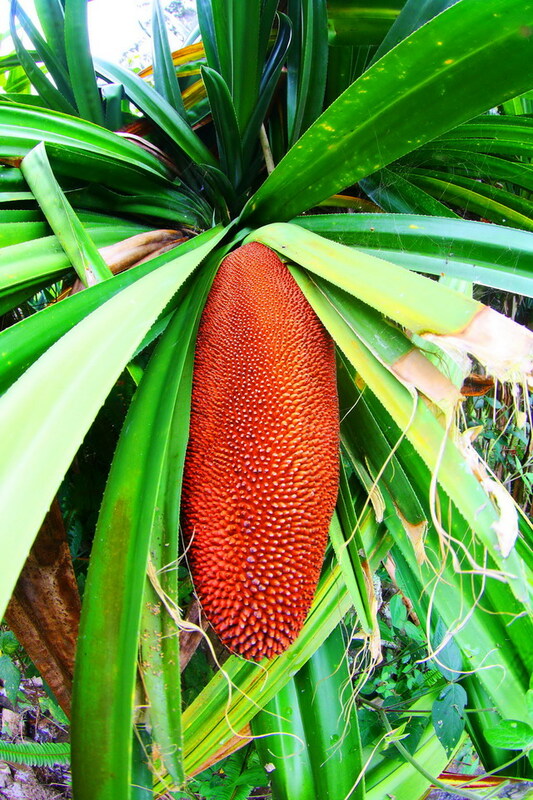 Red fruit with the scientific name (Pandanus conoideus Lam) widely spread on Papua Island to Papua New Guinea. This plant can live in the lowlands up to the plateau (2.500 m asl). The type of red fruit that exists today is distinguished by its fruit and size. There are red berries that are short red, brown, pink, long red, yellow, and yellow. Ceremony of Bakar Batu using buah merah as materials food. 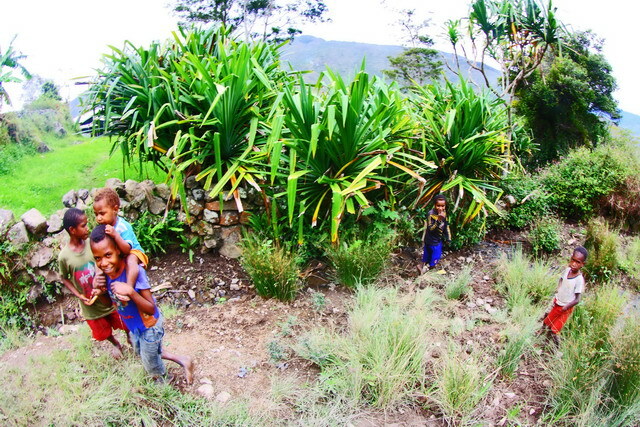 People in Papua, especially those in the Baliem Valley use red fruit as food. The oil that is in the red fruit is used as a food spice. 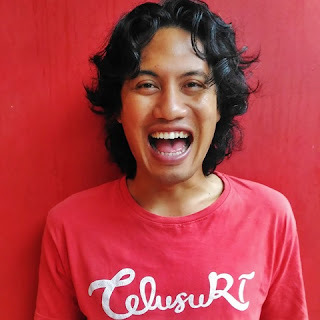 In the burning of stones/bakar batu, the red fruit will be included as a flavoring ingredient. Red fruit gives a sense of food to be delicious. More than 90% of red fruit is oil fluid. 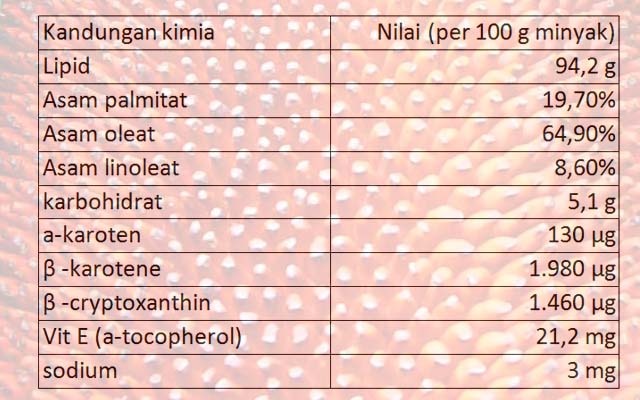 The oil in the red fruit is not included in the class of trans fatty acids, so it does not cause obesity, elevated cholesterol levels, constriction of blood vessels, and other cardiovascular diseases. That said, the oil in the red fruit is a good fat, different from animal fat. The red color of the red fruit is a carotenoid compound. Carotenoids are pigments or colors present in plant cell sections called chromoplasts. Chromoplasts are the site of pigment formation: melanin (black), lycopene (red), xantophil (yellow), carotene (pink), fikocyanin (blue), purple (anthocyanon), and ficoeritrin (brown). Carotenoids (alpha and beta) are very dominant in red fruit. The dominance of beta carotene is seen from the color of fruits and oils produced from red fruit. In the field of health, carotenoids are pro vitamin A sources that are good for eye health. Carotenoids also as a source of anti-oxidants to prevent cancer-free radicals free. Red fruit is a good example of how to optimize carotenoid absorption by the body. Carotenoids are a type of water-insoluble or non-polar pigment. Non-polar compounds soluble only by non-polar compounds as well as fat or oil. The oil content in red fruits becomes an effective solvent for dissolving the rubberenoid so as to facilitate the body to absorb it. The lesson I learned to dissolve the carotenoids had to use oil, so all this time the carrot juice, the tomatoes seemed to be in vain.